An unique, adjustable and soft memory foam pillow. 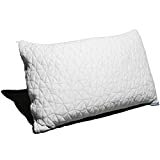 The Coop Home Goods Shredded Memory Foam Pillow is the number one best selling pillow on Amazon. And over 10,000 people have left a review, averaging 4.4/5. As you can imagine, that’s a lot of satisfied sleepers. But just because this pillow is highly regarded by so many people doesn’t necessarily mean that it’s the right pillow for you. We closely review the Coop home Goods Shredded Memory Foam Pillow, exploring it inside and out, so that you can make an informed decision. When your brand new shredded memory foam pillow from Coop Home Goods arrives in the mail, you will immediately be surprised by just how small it is. Coop Home Goods have decided to vacuum seal the pillow, to keep the size down. This allows them to ship the pillow for cheaper, and because memory foam returns to it’s original shape when decompressed, does not effect the quality of the pillow. The packaging is made up of two layers of plastic. The first layer helps keep the shredded memory foam pillow in tightly packed. The second layer is the vacuum sealed bag. When you open up the packaging, the pillow looks all lumpy and sad. Nothing like the plush pillow you see in the pictures on Amazon. This is a normal part of vacuum sealing. The foam inside of Coop Home Goods’ pillow has been squashed flat. And to return it to it’s former glory, you are going to have to fluff it out. 1. Dryer – Simply toss the pillow in your dryer for 10 minute son low and the pillow will come out plump and fluffy. 2. By hand – Kneed the pillow, pulling at the inner filling with your fingers through the cover. Fluffing up the pillow by hand will take no more than 2 minutes. The first thing you will notice, as you fluff up the shredded memory foam, is the awful smell that is given off. Unfortunately, this smell is unavoidable and is something you will have to put up with on any memory foam pillow. Memory foam does not have an amazing odor at the best of times. But this stuff is shredded. And it smells strong! If anything, I found it smelled stronger than other pillows made from as old block of memory foam. Who knew that something that is hypoallergenic could have such a strong odor? While it may be an assault on your nostrils, the smell is not considered to be harmful. The Memory foam filling inside is CertiPUR-US Certified foam, which means the foam is free from mercury, lead, flame retardants (PBDEs, TDCPP or TECP), formaldehyde and other nasties. But even though it may not be harmful, the smell isn’t exactly enjoyable. And the smell will likely keep you awake at night, even if you don’t have a sensitive nose. So the first thing you are going to want to do is get rid of the strong odor that Coop Home Goods has blessed your home with. The fast way – The easiest way to remove the odor is to turn to your dryer. Simply dry the memory foam pillow on low for two hours with a dryer sheet. The slow way – Take off the removable cover and allow the insides to sit in direct sunlight for 2 days. If you don’t have a dryer, it is worth keeping in mind that you will not be sleeping on Coop Home Goods’ pillow tonight. Also, even after we aired out the pillow, a faint scent still remained. However, the smell was hardly noticeable and virtually disappeared with continued use. Okay, now that your Coop Home Goods Shredded Memory Foam Pillow has been fluffed and deodorized, it’s time to take a closer look the pillow and whether or not it is right for you. The first Thing you will notice about the pillow is the unique cover. A unique triangle pattern has been sewn into the cover, as well as the Coop Home Goods logo. Coop Home goods has spent a lot of time designing a good looking cover. And if you were buying a pillow on looks alone, this eye catching design would stick out amongst the plainer looking pillows available. But what is most important is how the surface feels. Surprisingly, for a pillow shell, the material feels thick and heavy, yet soft. It almost reminded me of how a flannel sheet feels. On the left hand side of the cover you will find a zipper. An inner case with a second zipper! The removable cover design allows you to wash the outer and inner cover separately. And yes, this does mean that you can use the pillow without a pillow case if you so choose, treating the top cover as a pillow case instead. However, while the surface of the cover is soft, it doesn’t feel smooth or silky. My preference was to cover it with a high thread count cotton pillow case. Inside the inner cover, you will find the shredded memory foam, that is unique to just a few brands of pillow, Coop Home Goods included. It is the shredded memory foam that make the Coop Home Goods pillow truly adjustable. Unlike traditional memory foam pillows, which are a single big block of memory foam, the inside is made up of tiny pieces of memory foam that have been ran through a shredder. Hence the name, shredded memory foam. The filling is easily removed, allowing you to adjust the pillow to your desired height, which I will cover further down the article. Interestingly, the shredded memory foam inside Coop hoem Goods’ pillow isn’t uniform in size. The size of the foam varies from twice the size of a quarter right down to a fine dust. Now the interesting thing about this is that with both covers over the foam, the Coop Home Goods pillow doesn’t feel lumpy or clumpy at all. It feels down right soft. But there was a downside to the foam, especially the finer pieces. When you remove it to adjust your pillow, you will get tiny pieces of memory foam all over the place, which you will then have to sweep up. Now this is a pretty minor complaint, considering you will only adjust the memory foam filling to your desired height once, but it is worth mentioning. As for the firmness of the pillow, it’s soft, soft, soft. If you want a pillow that is firm and supportive, then this isn’t the pillow for you. To demonstrate just how soft the pillow is, we applied a 11 pound weight (the weight of the average human head) to the pillow. Before adding the weight, the loft of the pillow (height) was 8”. Our pretend head compressed the pillow by 4”. That’s half the size of the pillow. For those of you looking for a pillow that is soft, you will be impressed with the amount your head sinks into the pillow. Coop Home Goods claim that the shredded memory foam filling allows for air to circulate through, keeping you cooler than if you were sleeping on a standard memory foam pillow. I am not entirely convinced. You see, the shredded pieces of memory foam compress flat, under the weight of your head. If you remove some of the filling and squash it in your hand, you will see what I mean. And when it is compressed, their is minimal air flow. I felt that I slept the same temperature on the Coop Home Goods shredded memory foam pillow as I do on other memory foam pillows made form a single block of foam. But the biggest problem with this pillow is seen if you are a back or stomach sleeper, and you adjust the pillow to a lower loft. In the above photo we removed enough filling to make the Coop Home Goods Shredded Memory Foam Pillow comfortable enough for a stomach sleeper. The end result was reducing the loft to 5”. Now our pretend human head again sank 4” into the pillow. This meant that the head was supported by just 1” of memory foam. In real world use, this just wasn’t comfortable. The pillow felt neither soft nor supportive. It felt like I was sleeping on an old pillow that needed to be replaced. In the side sleeping position with little to no filling removed, the pillow was great, and I highly recommend it to side sleepers who are looking for a plush memory foam pillow. In the back sleeping position, with a some filling removed, the pillow was average. Good but not great. In the Stomach sleeping position that I had my partner test (and I will confirm), the pillow is just awful. It’s unsupportive and even when adjusted to our preferred density/height, the pillow was uncomfortable. This highlights the biggest problem with the Coop Home Goods memory foam pillow. The more shredded memory foam you remove, the worse it becomes. And part of the reason for this is that the shredded memory foam inside the pillow has a tendency to migrate. That is to say, it can move around underneath the cover. The more shredded memory foam you remove, the more space you are giving it to move around. This is a particular problem if you toss and turn at night. You will wake up to discover that the foam inside the pillow has shifted to one side or another. And you will have to fluff it again to return it to shape. But if you are only removing a small amount of shredded memory foam, then the Coop Home Goods shredded memory foam pillow is definitely worth considering. Do you sleep on the Coop Home Goods Shredded Memory Foam Pillow? Let me know in the comments below!